Some economists indicate that world developers and investors are facing a real estate boom. The same experts predict that the market will eventually overheat. However, demographic indicators and the ongoing migration from rural areas to cities seem to forecast something different: the increase in the number of urban dwellers will continue to fuel the boom though it can take on a slightly different character than financiers imagine. Especially when Chinese investors are interested in building empty cities all over the globe. However, these new buildings are simply not affordable to the rapidly growing population. The Chinese developers try to sell the new projects in Egypt, Nigeria and Ghana to a customer base in Europe and East Asia which, as the Gefira research team findings show, is shrinking at an incredible pace while those who only consume wealth in Africa and the Middle East are growing as weed. Investors and politicians who missed this trend will be wiped out by the end of the next decade and the same fate lies in store for real-estate investors. In the middle of the 21th century the earth will be inhabited by almost 10 billion people,1)World Population Prospects 2017, United Nations Population Division.of which urban dwellers will make up almost 70%.2)Percentage of Population at Mid-Year Residing in Urban Areas by Major Area, Region and Country, 1950-2050, United Nations Population Division.For comparison, the current urbanization rate is 55%, which means that urban areas are inhabited by over 4 billion people. In just over three decades the number of city dwellers will increase by 3 billion. Here the reader may pose the question whether the current towns will turn into cities, cities into metropolises, and metropolises will become agglomerations. It looks like they will. Still, these will not be (and in principle are not) the only transformations resulting from the progressing urbanization. A new trend that has been noticeable since at least the beginning of this century is founding completely new cities from scratch. They are created in uninhabited territories, even such as artificial islands or desert areas. Urban-architects create a futuristic vision of “smart cities”. The element that should make them stand out is self-sufficiency, understood as the greatest possible energy independence (based on the use of renewable energy or construction of municipal power plants), as well as adapted to urban conditions and an environment-friendly communication infrastructure system (ie communication system and planned network roads). The result would also be low emissions of harmful substances. The element that should make them stand out is self-sufficiency, understood as the greatest possible energy independence (based on the use of renewable energy or construction of municipal power plants), as well as adapted to urban conditions and an environment-friendly communication infrastructure system (i.e. communication system and planned network roads). The result would also be low emissions of harmful substances. New urban areas are also designed to have a much less devastating impact on the environment, due to the high technology industry. Such cities are already under construction. While Europe has ceased to build new cities and focuses on the enlargement of the existing ones, in the Third World – especially in Asia, but also in Africa – projects of ever-newer metropolises are conceived. Creating cities from the beginning may initially seem like an unprofitable investment. Nonetheless, sales of land to developers generate profit for the state treasury. The development of the construction sector positively affects related industries and services. Housing investments are a part of the financial system (including banking system) or real estate brokerage. In other words, the construction sector with other dependent branches has a significant impact on GDP. Investors are attracted to the construction projects not only because of their modern energy and infrastructure solutions, but also because these are usually special economic and duty-free zones. Therefore, flats are often bought by speculators, development companies and entrepreneurs who perceive them as an investment rather than a factor satisfying the living needs of the population. An example of this is the expansion of the Chinese real estate market, which caused the development of Chinese metropolises, the creation of uninhabited districts and entire cities. The purchase of housing often becomes more profitable than buying securities or bank investments. That’s the way it is, among others, in China, where 32% of the families have at least one uninhabited property.3)Chinese consumers lean on housing market as wages flounder, Financial Times 2017-10-19.Not only in China are construction investments becoming a way to shape economic growth. Construction and development companies from the Middle Kingdom are increasingly looking for places to implement new projects in countries with an urban population. In the last years the Chinese have signed agreements including infrastructure projects with i.a. Vietnam,4)Asia Pacific Property Investors Seeking Yield Spreads, Interest in Vietnam Rising, World Property Journal 2017-03-16.Cambodia,5)China to invest billions of dollars in ally Cambodia, ABC News 2018-01-11.Malaysia,6)Bubble on the horizon as demand falters, Nikkei Asian Review 2016-01-13.or with African countries.7)In Africa, Chinese Developers Are Building A Mini-China, Fast Company 2015-08-27.The Chinese developer Shanghai Zendai Property undertook to invest in South Africa, where it will build Modderfontein New City for about 100 000 people.8)Chinese developer to build new $8bn city in South Africa, Global Construction Review 2014-04-11.The construction of Forest City on the artificial island in Malaysia is also financed by Chinese investors.9)Malaysia’s Forest City and the Damage Done, The Diplomat 2017-08-30.Another project, whose contractor is China Communications Construction Group, is a Nigerian city EkoAtlantic, which will have 250 000 people. Another Chinese investor China Minsheng Investment Group (CMIG) undertook to build a Garden City in Cambodia:10)Chinese Group To Invest $1.5 Billion In Phnom Penh Satellite City, B2B CAMBODiA 2016-11-24.while in Georgia Hualing Group will construct the Hualing Tbilisi Sea New City, a satellite city to the capital. 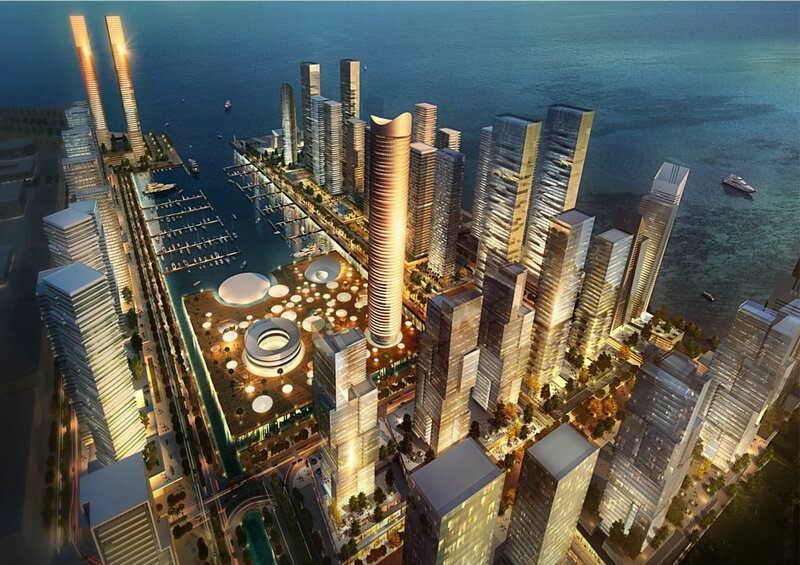 One of the most interesting projects is the idea of building New Cairo, the new capital of Egypt. Ultimately, it would be inhabited by as many as 5 million people on an area of over 700 km2. The main investors are China State Construction Engineering Corporation (CSCEC), which is also responsible for the designing part. City-building stimulates the overall economy, which is advantageous to governments, generates profit for businesses and provides housing for the common man. An important factor is also the last aspect, which (i) solves the problem of the population growth and (ii) corresponds to progressive urbanization of the country. Transforming rural into urban areas enables the absorption of the demographic surplus. To accommodate population growth in China alone, 400 new cities must be built, and 200 in India.11)Why Build a New Town?, Volume Project 2013-03-04. The Gefira team analyzed the price of apartments. In most cases, their purchase is beyond the reach of the average citizen. Who are they for? Wealthy foreigners. And indeed (table below), almost all websites of emerging investments are presented in English, and the official language of a given country takes second place. If the buyers of apartments were overwhelmingly foreigners, it would change the national structure of the state, and would also increase the disproportion between the rich and the poor. Nobody. 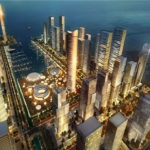 If real estate in new cities is not bought by foreigners, then these towns will become ghost cities, like the one built by the Chinese investor in Kalimba, Angola, which is inhabited only in 20%. Squatters. Finally, the possibility arises that if the cities are not inhabited by foreigners or by the native population, the houses will be occupied by the people without the owner’s consent. This scenario seems quite real, especially in African countries, where the urbanization rate is the largest among all continents (by 2100 the population of Africa will have increased by almost 400%! ), while the average individual income is the smallest. The expansion of the Chinese real estate market is presented in the current issue (20) of the Gefira Newsletter, where the interdependence between population changes and progressive urbanization is analyzed. 5. ↑ China to invest billions of dollars in ally Cambodia, ABC News 2018-01-11.